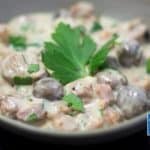 This Keto Turkey Stew recipe is an " Easy, Creamy & Warming" dish that's ideal in winter but makes a perfect dinner meal any time of the year. The turkey is succulent and the mushrooms are tender and full of flavor. Place a large non-stick frying pan over high heat and brown the turkey meat in the olive oil, then place into your slow cooker. Add the garlic, leek and bacon to the frying pan and saute or 3-5 minutes until the leek has softened. Add the sauteed mixture into the slow cooker, along with the thyme, salt, pepper, and mushrooms. In a mixing jug, whisk together the xanthan gum, mustard and cream. Add to the slow cooker and stir well. Stir through the parsley and serve alone or with a side of Creamy Broccoli Mash.